Hydrangea paniculata 'Le Vasterival' also known as Hydrangea paniculata Great Star as introduced by First Editions. 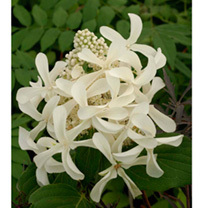 It produces white, highly-fragrant flowers with wavy, star-shaped florets. Flowering starts mid summer and will last until the first hard frost, providing many weeks of interest. This low maintenance shrub is best grown in organically rich, medium moisture, well-drained soils in full sun to part shade. Although it can be trained as a small single trunk tree, it is best grown as a large, multi-stemmed shrub. It’s a great backdrop and blends easily with other plants. Flowers July-September. Height 200-250cm. Supplied in a 7.5-10 litre pot. Hydrangea paniculata 'Le Vasterival' also known as Hydrangea paniculata Great Star as introduced by First Editions. It produces white, highly-fragrant flowers with wavy, star-shaped florets. Flowering starts mid summer and will last until the first hard frost, providing many weeks of interest. This low maintenance shrub is best grown in organically rich, medium moisture, well-drained soils in full sun to part shade. Although it can be trained as a small single trunk tree, it is best grown as a large, multi-stemmed shrub. It’s a great backdrop and blends easily with other plants. Flowers July-September. Height 200-250cm. Supplied in a 3 litre pot or 7.5-10 litre pot.